Wong Kar Wai's films live in the space between romantic daydreaming and obsessive longing. His films dwell in the ether that hangs over nostalgia for an ex-lover, where one idealizes all of that person's qualities and flaws fade away. Music that may have played in the background of a long ago encounter is never forgotten. It twists itself around melancholy images, tapping repetitively against memory until it is the memory that fades while the music and the feelings it evokes remain. 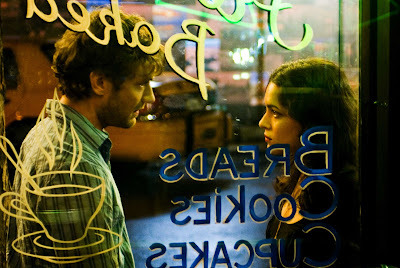 My Blueberry Nights, like most of his films, is a love triangle between a man, a woman, and their idealized romantic memories of an ex-lover. Wong's first English language film, it springs from the same domain as his other beloved films, Chungking Express (1994), and In the Mood for Love (2000), even though some of the charm may be lost in the translation. Conceived as a vehicle for singer Norah Jones, after Wong had enjoyed a meeting with her, it is a reworking of one of his short films. 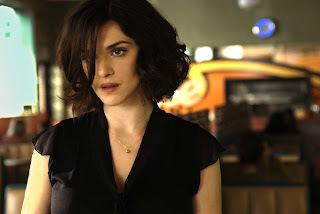 Jones plays Lizzie, a woman who strikes up a friendship with Jeremy (Jude Law), owner of a cafe in New York, after she is dumped by a boyfriend. Every night she orders a blueberry pie from Jeremy, not because she likes blueberries, but because customers generally avoid the pie, and she pities the fact that it is thrown out every night. As their conversations deepen, Jeremy starts falling for her. But Lizzie goes on a cross-country trip, meeting other characters in various stages of loneliness, and writing letters to Jeremy along the way. The colorful characters she meets are played by David Strathairn, Rachel Weisz, Frankie Faison, and Natalie Portman. In each she sees a reflection of what her loneliness could potentially lead her to be like. And each actor rises to the challenge of creating their roles with little to go on, as Wong frequently shoots with only an outline to guide him. Some of the flaws? Well, Wong's propensity for shooting without a script works against him here, as English is not his first language. He relied on mystery novelist Lawrence Block to help with dialogue. But since much of his films are usually improvised on set, he is not up to the task of catching cliche dialogue, of which there is much of here. Wong also falls prey to the trap that many foreign-born directors do when filming in America for the first time. Fascinated by the diverse landscape, they usually have their characters visit iconic looking locales in their stories. This movie is all neon signs reflected on car windows, elevated trains, dingy diners, and other such cliches, as the story follows Lizzie from New York to Memphis to Vegas. One of the charms of his Hong Kong films is how he occasionally references American pop culture in subtle, nuanced ways. In Chungking, his protagonist obsesses about the object of her ardor while addictively listening to The Mamas and the Papas' "California Dreamin'" repeatedly throughout the film. In Mood, it's Nat King Cole he fiddles with. Avoiding his overplayed American catalog, he instead places three of his Spanish language songs in the film, "Aquellos Ojos Verdes", "Te Quiero Dijiste", and "Quizás, Quizás, Quizás". Invoking that romantic singer, while choosing his less predictable Spanish songs, sets the proper ambiance while preserving the mystery for both his native and international English speaking fans. Here the references fall a little flat, as the iconography of America looks a little less bold outside the setting of Hong Kong. But these flaws are easily overlooked and don't deter from one's enjoyment of the film. Contrary to rumors, Jones acquits herself decently in her first film performance, mostly because the role was created for her. She has little stretching to do, playing a wide-eyed innocent who nonetheless feels like someone who has lived, which is the persona one gathers from her recordings. Her sweet looks belie the smoky voice she performs with (one of her songs is used in the film), which is probably why Wong was fascinated by her in the first place. Her next role may prove to be more of a challenge. The cinematography by Darius Khondji is lush and candy-colored. Every shot is impeccably staged and composed for maximum beauty. It befits the dreamy romanticism of Wong, and actually gives the beautiful In the Mood for Love a run for its money. My Blueberry Nights is an interesting venture into American cinema by one of Hong Kong's premiere directors, with his sensibility staying intact throughout. Definitely recommended if you're a fan of any of the artists involved in its production. This entry first appeared on Blogcritics on 7/1/2008.